Jeffrey Nimer (b. September 25, 1969) is a renowned and highly respected chef who has worked with some of the world’s most powerful celebrities and business executives. As the founder and owner of Los Angeles restaurant Haute Chefs, Jeffrey Nimer offers a full line of culinary services on TV and movie sets, as well as for a number of Hollywood’s major stars. He is noted for providing a first-class presentation for celebrity parties, sporting events and other special occasions. The love of cooking runs in the family of Jeffrey Nimer. He learned the art of and the appreciation for culinary excellence from his grandfather, who owned a restaurant in the Miami area. His mother is an experienced chef who has been widely hailed for her carefully crafted Lebanese meals. As a wonderful addition to Nimer’s dining experience growing up, his father recommended the best wines from his work as a sommelier. In 2005, Jeffrey Nimer started Haute Chefs Los Angeles to share his appreciation for both traditional and modern cuisine. From private weddings to charity functions, he combines a variety of different culinary styles into a unique blend that is sure to please the palate. Jeffrey Nimer has been honored on numerous occasions for his culinary prowess and client satisfaction. As a result of his award-winning work with the Loews Santa Monica Beach Hotel, he received a nomination in the category of Best Hotel Chef for the prestigious James Beard Award. The James Beard Award is the highest honor for culinary excellence in the country. He has also earned recognition in industry magazines like Wine Spectator – and major newspapers including the Miami Herald. Jeffrey Nimer currently resides in the Los Angeles area. Jeffrey Nimer is a world-class chef who has contributed to special events hosted by famous movie stars and powerful business leaders. As the sole creator of Haute Chefs, a restaurant and catering company located in Los Angeles, Jeffrey Nimer designed a culinary experience that has been featured on television and movie sets. Charity balls and celebrity galas are among the numerous other events served by Jeffrey Nimer and the Haute Chefs staff. 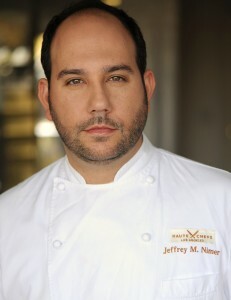 The first big break in the career of Jeffrey Nimer came at Christy’s, a popular restaurant in Coral Gables, Florida. There he developed the seafood menu in addition to other kitchen duties. Jeffrey Nimer was named the private chef at Al Amir Productions in 1997. In this role he served as a manager of kitchen personnel and developed menus for extensive yacht voyages, featuring wine dinners and room service. He also produced theme menus for families and selected food for special occasions. After his stint with Al Amir Productions, Jeffrey Nimer accepted a position at Miami’s Baleen Restaurant as an executive chef. In this role, Jeffrey Nimer served as the lone kitchen chef and also managed kitchen personnel. His culinary creations were lauded in local and national publications including the Miami Herald and Wine Spectator. Jeffrey Nimer then transitioned into a position as personal chef for Gores Technology Group, followed by a similar placement with well-known record executive David Geffen, whose Geffen Records has been home to a host of famous musical performers including Elton John, Cher and Olivia Newton-John. In 2005, Jeffrey Nimer embarked on his own venture, Haute Chefs Los Angeles. Here, he creates wonderful cuisine within the Los Angeles area, melding his love of bold and bright flavors with a simple, sophisticated presentation. Jeffrey Nimer has been the recipient of many accolades for his culinary talent. As a chef at the Loews Santa Monica Beach Hotel, he earned a nomination for the James Beard Award in the category of Best Hotel Chef. He’s also been hailed as a top talent by publications including Wine Spectator. Jeffrey Nimer currently lives in the Los Angeles area. Michals, Susan. “Jeffrey Nimer’s Haute Chefs L.A. Caters to JLo, Rupert Murdoch and You.” Haute Living 1 December 2010. Ferguson, Wes. “Star Diet: How to Shop Like a Celebrity Chef.” Young Hollywood 8 November 2010.